Do you ever find a food or drink you like so much that you brush away the opportunity to try something new? I get like that sometimes. You stare at a menu longer than necessary because you know good and well you are going to order the same thing you always get. Same pizza toppings week after week, the same flavor cereal always ends up in your cart, the barista already has your coffee order started as soon as they see you pull into the parking lot. I think it's a rut that a lot of us fall into every now and again. I'm a tea drinker, usually sticking with unsweetened black or green iced tea in the summer and a steaming mug of unsweetened black tea when the colder temps start creeping in. Sometimes I'll add a hit of fruit or honey to my tea to feel like I'm shaking things up a bit, but even I'll admit that's boring most days. Over the summer, I had my first bubble tea and a whole new world of tea drinking opened up to me. I have never understood why the English added milk to their teas because it just sounds like a gross combination to me. However, after having that bubble tea, I was like mmmm hmmmm. I get it now! After that experience, I was a bit more open to trying different tea varieties and decided I'd try making some Chai Tea with a recipe I found at Golden Blossom Honey. And you know what? I loved it, too! 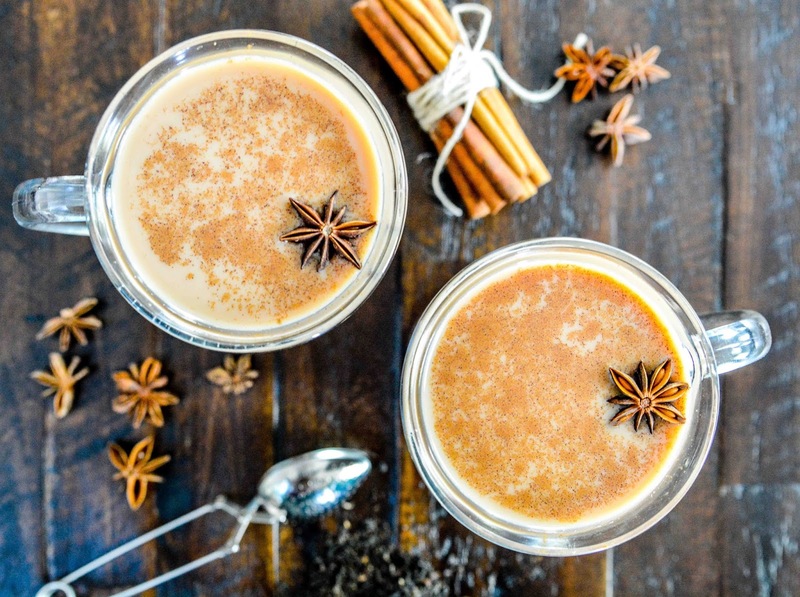 This chai tea seems like the most perfect drink for fall. Served at a warm temperature combined with its warm spices make me feel like I'm getting a hug in a mug. If you prefer your drinks a bit on the colder side, it's also delicious served over a cup of ice. Either way, it's all good to me. No milk for me in the tea, thank you very much, I will take mine with lemon and honey or some of the lovely cancerous sweeteners :) I do sometimes put a bit of vanilla sugar or caramel sugar in my camomile, but rarely. I do like to put mashed banana and orange in it, though. I do love me seethrough cups and mugs and the title of the post is ever so lovely, deary. Our temps have dropped drastically, it's currently like winter here this week, so I think everybody is taking out tea out of their cupboards. It's totally opposite here in temps! We are back to scorching heats. Even I felt a little miserable yesterday. I did stop at McDonalds for an iced coffee and the lady tried giving me a hot cappuccino. Seriously? Who could drink a hot coffee on a day like that!? A hug in a mug works for a rhyme any time. Milk is still scary, blah to that lol tea I don't mind but most of it gives my stys, so I stray away. I used almond milk in mine since I can't do dairy milk, so I think you could substitute for your milk of choice. Like the rhyme, do you? I just made some Chai Tea, but it was a mix. This looks MUCH better. I'm pinning it now. I do think homemade is usually better than mixes. Yum - I love tea. I live in the town that claims to be the first to create sweet tea. (Unsweetened tea - I just CAN'T do it - it's the southern in me). LOL! :) But I love hot tea with a bit of milk and honey or sugar. This looks amazing, and will be great on a crisp, fall night. Oh, how I miss southern sweet tea. I swear it was all we drank growing up in Tennessee. My mom still makes a mean pitcher of it, but I try to avoid a lot of sugar since it is a trigger for my autoimmune disorder :( I have to add a touch of honey when I want a bit of sweetness these days. I love chaie tea. It has such a great flavor. I love the addition of honey. It really is a hug in a mug! Ahh! I can already feel myself warming up! I'm bookmarking this for the fall and winter months to come. I live in New York, so you know... COLD! I love Chai tea, it's so good. I've never tried making my own though. We are total chai tea drinkers in this family! I cannot wait to try your recipe and I am definitely going to add the honey to it for that extra sweetness I always crave! That's really lovely. I would love to drink more tea especially since it has a lot of benefits! Chai is one of the teas that I enjoy drinking! Looks like a lot of spices are in that mug. I like tea but not as much as I love coffee. I will try this recipe. I love anything with cinnamon and this looks like an interesting drink I would like to have when the weather starts to get chilly. Wow this looks delicious, going to give it a try this weekend! We are obsessed with anything cinnamon! My DIL (who is English, btw) introduced me to Chai Tea and it really is good. I'm usually a coffee drinker, but I do find myself being more and more drawn to different kinds of tea. This recipe sounds good. I don't know why but I've just never liked Chai tea. If I'm choosing a tea it's general going to Jasmine or Oolong. If I'm going for a wintertime favorite, Caramel Apple Spice is my crack. 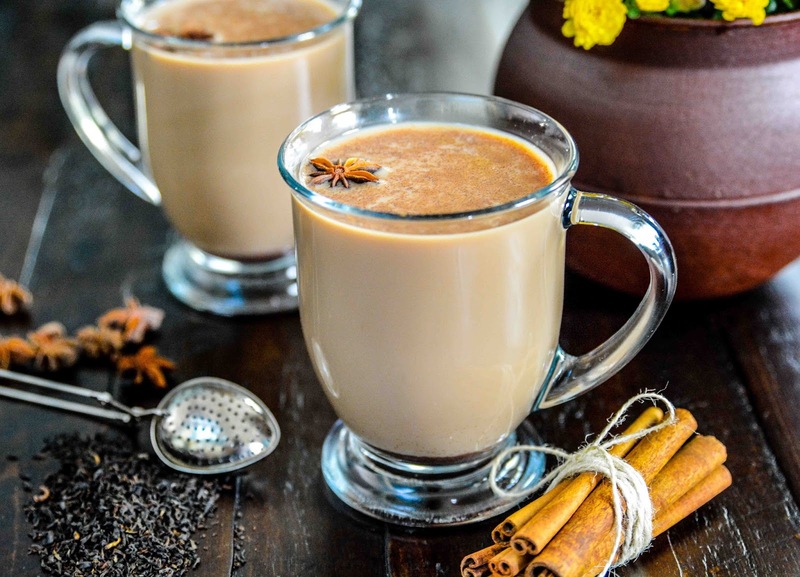 The chai tea looks delicious, and I love the star anise which makes makes the tea look beautiful and adds pop to your photo. Golden Honey Blossom looks like a gold mine for good recipes.